Weirdly mangled email in Gmail App only? I don't even know where to start. Even the header is broken as it's not going the full width for some reason, but I really can't understand how the "Layar is Hiring!" part can get outside of the white background container that it resides in. It looks like there's a </td> missing somewhere or something, or some sort of colspan issue, but like I said, this looks perfect on EVERY other test client (save for Lotus, I don't test those). 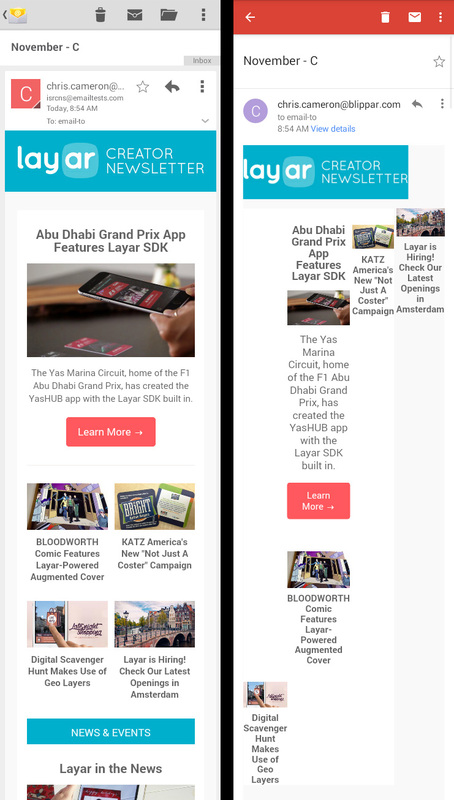 I tested this email IRL with an Android device and it looks fine, but that phone might be too new or have a different/larger resolution than the one used for Litmus previews. Basically I can't reproduce this on an Android device but the previews look like this. I also didn't used to have this issue until I noticed it recently, so I can't tell if it's me or if maybe Litmus is having an issue? Any chance of seeing your code, mate? Odd, this is showing absolutely fine for me in Email on Acid tests and live Gmail tests. Have you changed anything since your tests? I did find one issue though on line 292, the area where you have the 'See More Campaigns' button. You have gone from an opening cell to an opening row without a table in between. This did not effect the layout at all though so I don't think it would have caused your issue. Nope, haven't changed it, and still seeing the weird result on Litmus. I'll see if the issue you mention fixes it. I recently had an issue with gmail app because it doesnt show mobile version, it shows desktop version. I had to force the first table in my HTML to have a min-width equal to whatever the width of my email is (in my case 650) and it solved the problem. Not sure if this will help you but I had to look around for a while to find this.